We’re having a very quiet weekend without any externally infused fun. And the usual swimming, tennis, riding, etc. lessons are suspended for a week. We are teaching that activities are earned, not granted. The alternative is a lot of alone time in one’s room. With one day down I assure you it’s going to be a long week! For one person solitude may seem like a penalty while for another it’s a reward. I am the latter. What would I give to be relegated to my room with a good book? I would joyfully forgo television, computer, iPad, iPod, iThis and iThat for some quiet, entertained only by a good old fashioned bunch of pages stuffed into a binding. It need not even be highbrow literature; I also love to indulge in a juicy People Magazine. I used to think that I was born in the wrong century. Now I think I may have been born into the wrong culture altogether. This past week my children’s school hosted Lisa Napoli, author of Radio Shangri-la. A radio journalist, she documents in her book the incredible experience of starting a youth-oriented station in the “happiest kingdom on earth”. No, not Disney Land– Bhutan. Neighboring China and India, this relatively unknown Himalayan kingdom existed contently without modern “amenities” until 1999. At that point television was introduced, and thus began a cultural explosion that would forever change the economic, political, social and educational landscape. I could write at length about Napoli’s insightful account of her journey to and within a culture quite literally a world away from our own. But the most fascinating conversation (in my opinion) is that of technology and social media, and how their presence tempts one to lust after what others seem to have or do, rather than to find fulfillment in one’s own pursuits. Clearly I am conflicted by the simplicity of living without technological advances and reaping the benefits of them. Case in point is my iPhone, which as I understand, will be rendered obsolete shortly by its next generation, just now falling into the hands of eager devotees. I dragged my feet in acquiring one, but I now admittedly adore it. How else would I not only capture these photos, but also share the experiences almost instantaneously? Take yesterday when I discovered one of the most incredible jogging routes to date. I ran seeking solitude. 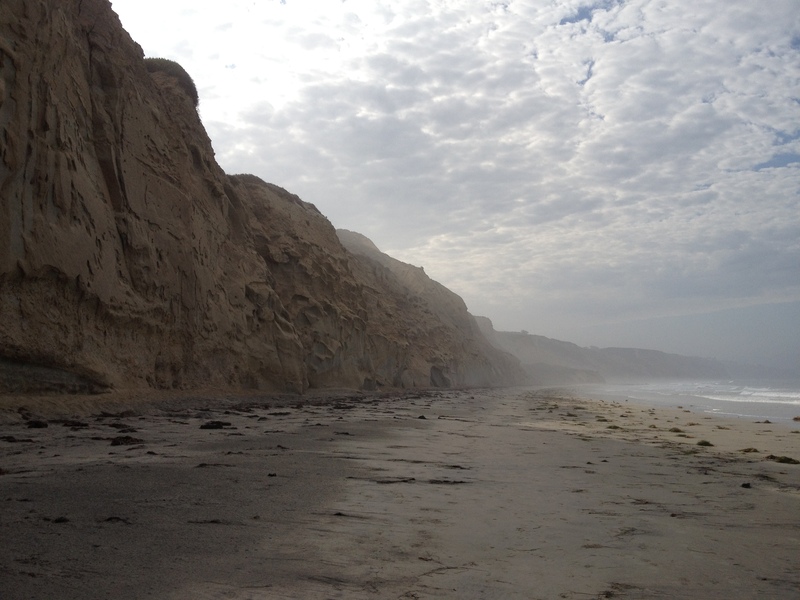 I meant to savor my alone time in the Torrey Pines Preserve and along the beach that I had completely to myself. There’s a cliff that juts out into the water (depending on the tide), and those who wish to journey beyond the main stretch of beach have to delicately climb the very narrow natural path carved into the massive rock. 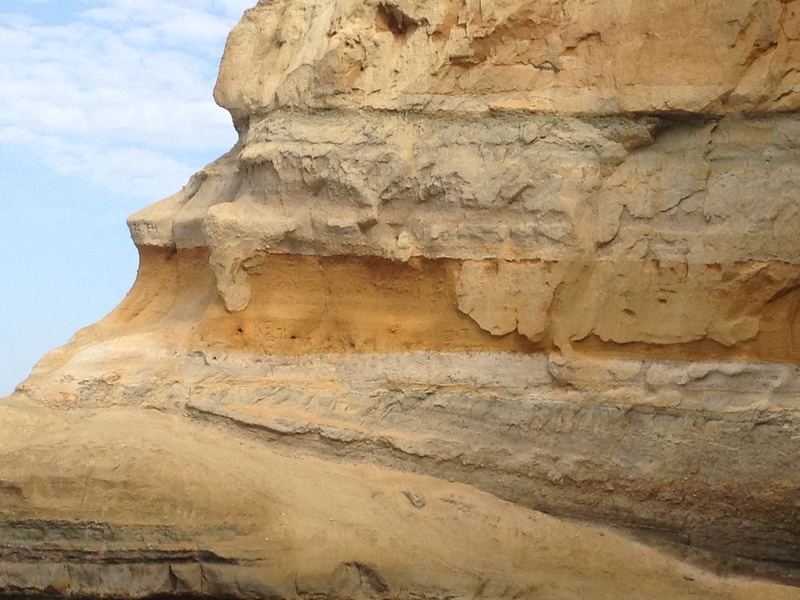 I took that route, which dropped me into a spectacular and unoccupied convergence of sand, waves, cliff and sky. Armed with my magic phone, I was soon itching to share my experience, ironically surrendering solitude. I just had to send the photos to my mother (whom I knew I wouldn’t be able to entice down there) and to my husband (whom I knew would be drawn in the very next day). I suppose technology transports us to places we won’t ever go, and lures us to those we otherwise wouldn’t have considered. And lest you call me a naive purist, I acknowledge that while one child was “enjoying” enforced alone time, the other was plugged into the iPad, affording me the time and peace to produce this post. This entry was posted in Uncategorized and tagged Children, Family, iPhone, Kids, Lisa Napoli, Radio Shangri-la, Running, San Diego, Social Media, Solitude, Technology, Torrey Pines Preserve by Rebecca Marks Rudy. Bookmark the permalink. Loved your pictures and your post. sounds like you are enjoying California. your writing is so fresh and honest–I love reading them. Thanks for coming to mentioning my talk in your beautiful post. You might find the Adam Gopnik essay from ten years ago in the New Yorker, Charlie Ravioli, of interest….about the impact of technology and busy-ness on kids.